HOME > COCOABUTTER BATH SOAPS > 6 Cocoabutter Soaps for the price of 5. Cocoabutter Only. 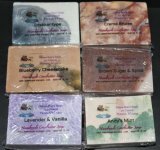 Keep everyone in the family happy and get a free soap.. just let us know which 6 scents you want. Does not include the Artisinal Soaps.